As you know, I love the ability to organize, categorize and optimize all parts of my life. Throughout 2017, I’ve had the opportunity to sample different productivity systems in an academic and professional setting. Adjusting to full-time work was truly a challenge but I’m adjusting thanks to new productivity tools. With my latest resources and new perspective, I have a list of tools that I plan to optimize in 2018. Hopefully, these will help you organize your life as well, or at least spark the interest in doing so. My first tool, Pocket, is an online application that allows me to save articles and read them later. Formerly known as, Read It Later, Pocket provides organization to your articles with tags and archive options. I had to research Google Chrome plugins when I found myself with 10 open tabs of articles every day. This became harder to manage and even harder to keep up with when I had to set the reading aside for pinging emails at my desk. Now I “pocket” all interesting articles and categorize them for later. Most of my articles are personal development/reflection, writing tips, marketing, and entrepreneurship. I haven’t found the right time to sit down and actively read them all, but Pocket does provide an easy system to collect pieces of writing that I plan to reference down the line. Pocket is a free app that includes audio playback on their mobile app! I tested the Passion Planner free download for a semester while I was in graduate school. Recently, I printed a few months of the A4 version and put the sheets into a binder. Being able to see most of my weekly goals and plans in a single spread was the best feature. Since starting my “big girl” job, I found myself attracted to the Passion Planner again, searching for a way to organize my “downsized schedule” and better outline my non-career goals. The Passion Planner empowered me in unexpected areas of my life though! I now track professional accomplishments, key dates (i.e. my last doctor’s appointment, etc.) and spending…all in one clutter-free place. Thanks to a simple color coding system, my planner has become a beautiful daily journal. The Passion Planner ranges from $15-30 and goes on sale all the time. I recommend signing up for their email newsletter to receive the download password for the free trial printables. About halfway through the year, I had a renewed dedication to living a healthier life. Obviously, part of that commitment was to incorporate new habits. I was recommended to download the “Habit Tracker” app on the Google Play Store and it has done wonders! I started with 3 simple goals: Daily Hydration, Exercise, and Daily Bible Study/Reading. I recently incorporated Clean Eating and Daily Writing as well. These habits are very important to me and my journey to a healthier lifestyle. So, I decided to track them to determine my consistency. Early on, I noticed that my consistency was terrible. I would not have known that if I didn’t take the time each evening to track my habits. Although it seems harsh, those reminders served as motivation and I plan to keep up with them! This app is also in the Google Play Store. I use it as a supplemental app for my Habit Tracker. Since I am terrible with my water intake, I downloaded this app that reminds me each hour to drink and updates me on how many ounces I have left for the day. This app instilled a sense of “thirst” for me. I know that sounds weird, but coming from someone who is always unknowingly dehydrated, my body learned how to “want” for water again. This app has been a huge help and I plan to continue to use it until my water intake is up to par daily. A gym membership may seem like the first thing to cut from a budget, but not when it’s contractual! With the chance to enroll in a year-long membership through my company, I immediately took advantage of the discount. There were “dry patches” when I wanted to give up and cancel my membership, but thank God that I’m locked in for a year. Once I began to look at my obligatory payments as an investment, I have been taking advantage of my gym membership even more. With a goal to visit the gym at least 4 times per week, I incorporate workouts that exclusively use equipment that I cannot find at home. Taking advantage of these items remind me of the membership benefits and my healthy lifestyle progress. Lastly, I plan to use the budget template I created in 2017. When I started my new job, I wanted to be prepared for all of my new income and expenses. I knew my income would drastically increase, but my expenses would too. To avoid the shock, I planned out a super detailed budget before even receiving any money. Since June 2017, I’ve been using this budget template and staying on top of all my expenses. For 2018, I plan to use the B Chic University Finance Workbook to better strategize my money. I’ll be taking the time to cut unnecessary spending, beefing up my savings, and slashing my debt. This won’t all happen at the same time, and it definitely won’t be done right away but I’ll be on a great path to healthy money management. For an in-depth look into financial planning and budgeting, take my Budgeting Basics with Google Sheets course on Udemy! And for signing up through this site, you get a special offer. The budget template in this course is also more extensive and detailed instructions are provided. 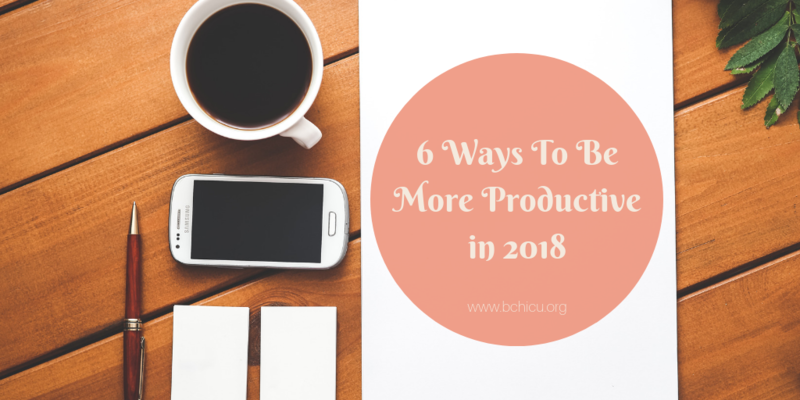 Do you have any productivity tools in the wings for 2018? Let me know and I’ll try them out!